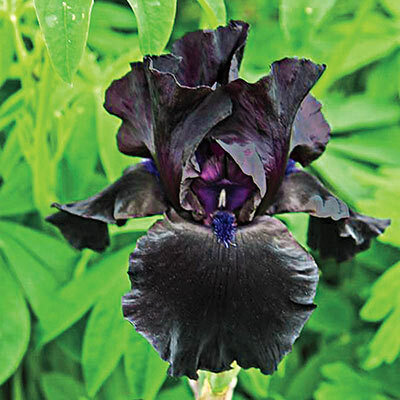 This intense, black bloom is dark all over, with the beards sporting a deep blue hue. 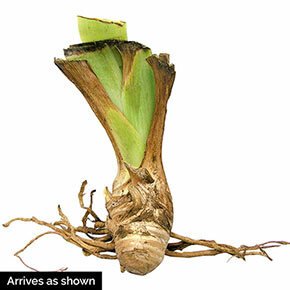 Its uniform size and sweet, lingering perfume only add to its appeal. Flowers are fan-shaped, with three drooping petals called falls and three upright petals called standards. Flower Form: Typical iris like. Large flowers. Foliage Type: Fans of green sword-like upright leaves in spring and summer with some dying back in colder climates in winter. Pruning: Remove spent flower stems. Cut back foliage to 6" fan in late fall. Clean plant debris before winter to prevent borers overwintering.